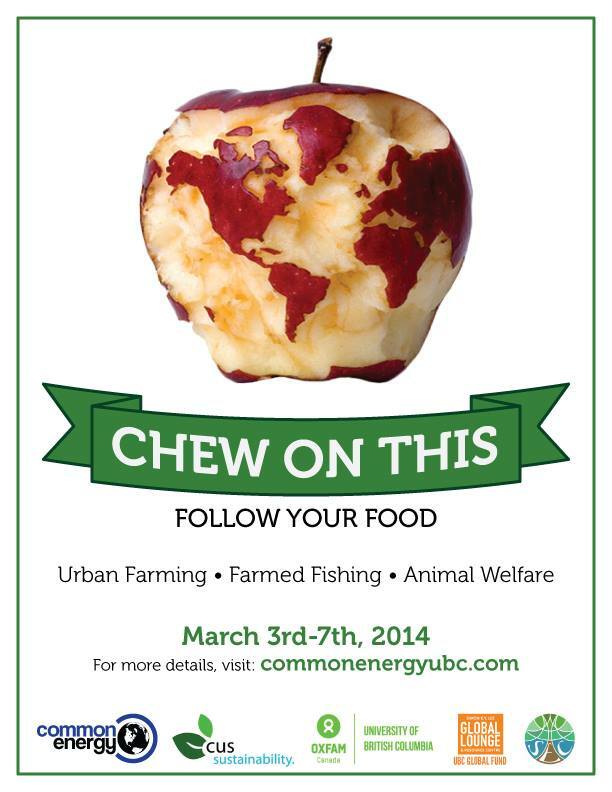 Join Common Energy UBC, CUS Sustainability, and Oxfam UBC for our annual Chew On This conference! Chew On This is a week long conference surrounding sustainable food options. This year we are focusing on “following your food” from its source all the way to your plate. -Prizes include gift certificates to some of the best local restaurants in Vancouver! Grow Your Own Herbs Workshop! Learn how easy it can be to grow herbs in your tiny dorm room! Not only will you save money on expensive spices, you can be confident they aren’t covered in pesticides! All ingredients/supplies will be provided for free, so just bring your awesome self! UBC student Dominique Goulet will be discussing how you can contribute to reducing GHGs! Samples will include cooked insects as well as cookies and protein bars made from insect products such as cricket flour. Our very own Chef Steve from right here at UBC (Place Vanier) will be discussing the benefits of eating local and how easy it is to eat foods produced within a 100 Mile radius of UBC. We have the pleasure of welcoming researcher Dr. Shannon Balfry from the Vancouver Aquarium, communications rep from bc’s largest farm salmon producers and a rep from the bc salmon farmers association to dive into the topic of Farmed Fish in BC. What is it? What are some of the benefits and trade-offs? Come find out at this great discussion! Small-scale, Local, Organic, Grass-fed, Sustainable– these all mean good animal welfare right? You might be surprised. In this session Gosia Zobel and Jesse Robbins, Graduate Students in UBC’s internationally-renowned Animal Welfare Program – will explore the complex and often overlooked role animal welfare plays in agricultural sustainability, so that you can make more informed decisions. This annual event is not one to be missed! Delicious food and discussions about global food security will have you thinking about how the rest of the world eats. Anyone who has attended this event in the past will tell you that you will not regret coming out for this incredible experience! 1. Hiring for the 2014-15 Common Energy Steering Committee! Applications for next year’s Steering Committee are now open! We are hiring for 6-10 positions, including Assistant Director Internal and Team Coordinators. You can find our application on our website: https://commonenergyubc.com/2014/02/03/2014-15-steering-committee-applications-now-open/. We encourage all interested applicants to apply!! Come enjoy Fair Trade Certified Chocolates with Common Energy’s Tangible Solutions Team! Our next Common Energy Big Team meeting is coming up on Sunday, March 2 from 5:30-7:30pm. This is our penultimate Big Team, so make sure you are able to join! 2014-15 Steering Committee Applications now CLOSED! Applications for the 2014-15 Steering Committee are now open, and we encourage all interested applicants to apply! This year, we are hiring for 6-10 positions, including Assistant Director Internal and Team Coordinators. See below for application details, or download the PDF version here: 2014-15 Steering Committee Application. Please contact us at commonenergyubc@gmail.com if you have any further questions. To apply, please submit your resume and answers to the Supplementary Application Form (found below). Applications are due by 11:59pm on Monday February 24th, 2014. Please submit by email to commonenergyubc@gmail.com. Mission Statement: Common Energy is the largest and most active student sustainability organization at UBC. We are working to incorporate sustainability into all aspects of the UBC community. We aim to affect real change by building strong networks and working proactively with the University. We strive to foster leadership and engage our peers through innovative programming. Our programming includes: events related to energy conservation (Sweater Day, Earth Hour), waste reduction (Tap That Campaign, SUB Waste Audit), sustainable food access (Chew on This), sustainable living (UBC’s Got Skillz, Green Living at Home), and student engagement in residence. If you are not familiar with Common Energy, we invite you to check out our online community: www.commonenergyubc.com, “Common Energy UBC” on Facebook, and CommonEnergyUBC on Twitter. If you have any questions please e-mail commonenergyubc@gmail.com. Our organizational format: The success behind Common Energy is through our distinctive team-based work. Each team of 5-12 student volunteers is led by one (or two) Team Coordinator(s). The Team Coordinators all join the Assistant Directors (Internal and External) and Director to form the Steering Committee. This year, we are hiring for 6-10 positions, including the Assistant Director Internal and Team Coordinators. Two of our Team Coordinators will also be Work Learn positions with Campus & Community Planning, focusing on zero-waste events and sustainability in residence. The role of the Assistant Director Internal is integral to Common Energy. The Assistant Director Internal oversees professional development training for both the Steering Committee and the entire team; organizes monthly Big Team meetings; organizes Steering Committee meetings; and plans the annual Steering Committee retreat. This job formally begins in September 2014, but approximately 30 hours of meetings, phone calls, and planning is expected before August 31, 2014. Applicants must submit a resume and their answers to the Supplemental Application Form. Team Coordinators are a key component to Common Energy. Team Coordinators lead their individual team in planning events and initiatives, and contribute to the Steering Committee. This job formally begins in September 2014, but approximately 20 hours of meetings, phone calls, and planning is expected before August 31, 2014. Applicants must submit a resume and their answers to the Supplemental Application Form. Please note that the Work Learn Team Coordinators will have additional benefits and paid commitments, beginning in July or August, and must be in Vancouver for the time. More information on these positions will be available during the interview process. Please answer all questions in 200 words or less. Which role(s) are you interested in fulfilling? Why do you want to be on the Steering Committee in Common Energy? Describe an experience you have had that has prepared you for a role in the Common Energy Steering Committee. Were you working alone or in a team? What was the beginning goal and the end result? What do you feel has been Common Energy’s most important contribution to the UBC community?